Sometimes you just misunderstand things. You hear something differently than what was intended. Or, as in my case, you wrongly identify an object— and in so doing miss its entire function and purpose..
Last weekend we traveled to San Antonio to speak at a marriage retreat. We had a wonderful time with the church, and enjoyed some special time with our friends, Mike and Anne-Brigitte. The church is San Antonio is warm and welcoming. In fact, Anne-Brigitte sent us home with a “Texas basket” – full of goodies. Inside the basket were scrumptious treats, mementos of Texas, a few books and even a wonderful toy for our dog(s). I was amazed that these Texans even remembered our dogs—that they were lucky enough to be recipients of fine Texan hospitality. We enjoyed the treats and our dogs loved the dog toy. It was one of those braided toys—blue in color. Our small dog is ten years older than our two-year-old golden retriever. The little dog particularly loved the toy, so being the “alpha” dog he rarely let the big dog take a turn. However, we played tug-of-war and “catch” with the new pull-toy. You see, it was his favorite toy—ever. I even snapped a photo to send to Anne-Brigitte, showing our little dog’s enjoyment of his new toy and sent her a text thanking her for the thoughtfulness toward our furry friends. Imagine my surprise today, a week later, when I noticed the toy was unraveling. 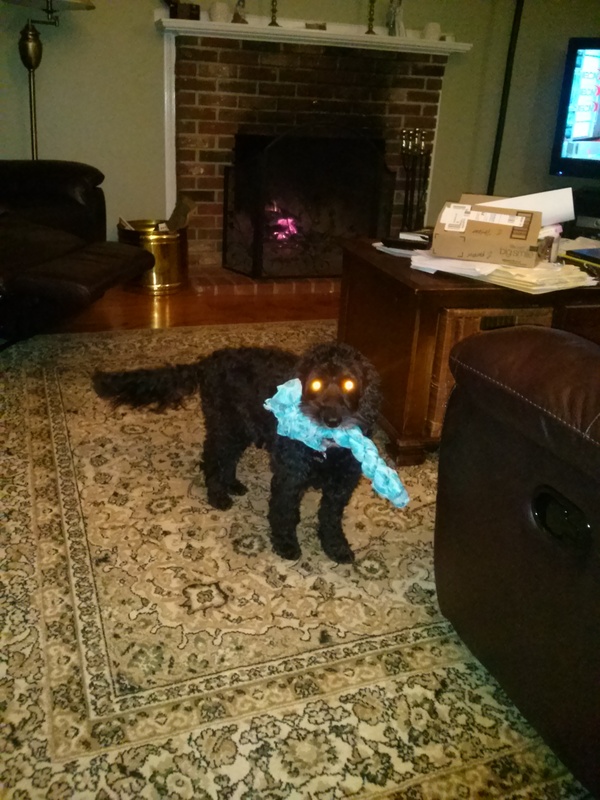 I took it in my hands to see if I could fix it when I noticed that it was, in fact, not a dog toy but instead a beautiful blue scarf (creatively tied.) Whoops! Sorry, Anne-Brigitte. At this point, I didn’t have the heart to take this beloved toy from my dog. And to be honest, it was well worn by then. I thought about this scarf-dog-toy. It’s all too easy to be given something of value—and yet fail to identify it as something as valuable as it truly is. Then, the dog just ends up carrying it around in his mouth. It would be a bummer to stumble upon a colorful old piece of paper in our attic and because it seems old use it to line the bottom of the dog crate—all the while not realizing a famous artist painted it. I thought about the promises of God. How do you view his promises? Do you see them meant for you, or for someone else. Sometimes I can get busy and even miss the point of Bible study. While I did miss out on a beautiful new scarf because I didn’t recognize it was for me—what a tragedy if I were to read the scriptures—and yet miss out on a relationship with the author. This entry was posted in devotional thoughts and tagged appreciation, God's gifts, perspective, promises of God by jeanieshaw. Bookmark the permalink. Your dog toy story is very humorous. The the analogy you make to the treasures God has for us in his word and in our relationship with him and others is more serious. I wonder how many times I missed or misused the truths and treasures of God, and how many times people have gasped wondering, “What is she doing?” This thought makes me grateful for true friends who will lovingly say, I think you don’t understand what you really have. Hahaha I LOVE this story, Jeanie. So many applications!